“Hallo Spaceboy” originally appeared on Bowie’s 1995 album Outside. The track was co-written by Bowie and longtime collaborator Brian Eno. 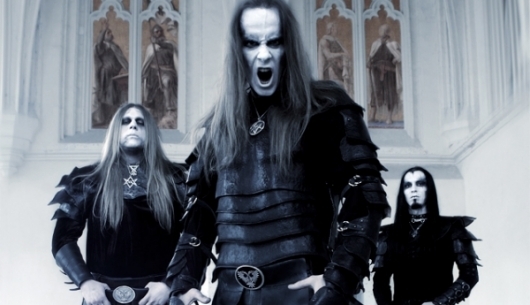 Polish blackened death metal giants Behemoth recorded their cover of the song during the sessions for their 2001 album Thelema 6. It did not make the final cut of the album, but instead appeared as a bonus track on the extended single for the song “Antichristian Phenomenon.” The title was also inexplicably changed from “Hallo Spaceboy” to “Hello Space Boy.” It is one of the stranger Bowie covers out there, but it actually works pretty well in a death metal context, which just goes to show the universal appeal of the man’s music. Behemoth are touring the U.S. this spring (with Myrkur opening) and they will be performing their album The Satanist in its entirety. It will be interesting to see if “Hello Space Boy” makes it into the set. I’ll let you know when I review their May 7th show in Santa Ana, California. When I was growing up in rural Indiana in the early ’80s, there was very limited access to heavy music. These were the days before MTV blew up with the whole hair metal, Headbangers Ball phenomenon. But on Sunday nights, there was a two-hour radio show that came from WOXY, just across the state line in Oxford, Ohio (home of Miami University of Ohio). It was called Massive Metal for the Masses, and I would wait all week for it to air. It was through this show that I was introduced to bands like Venom, Bathory, WASP, Michael Schenker Group, Slayer, and countless others. This Monday weekly column is my tip of the hat to that show. I call it Massive Metal Monday. Every week, I pay tribute to defining moments by the artists that laid the groundwork for heavy metal to become the worldwide cultural bond for all of us metal heads.